Simon Ainslie, managing director at Nokia UK, said: “The Nokia N96 is going to provide a gateway to quality viewing on the move. “The enormous success of iPlayer has demonstrated the desire audiences have for accessing programmes at a time and a place that suits them,” he added. A BBC spokeswoman said the iPlayer is already available on the iPhone and iTouch, but only for streaming programmes. 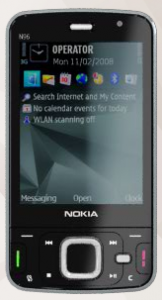 The Nokia N96 will be the first phone that enables users to download programmes as well, she said. This is quite a coup for Nokia in more ways than one. First up, as the above quote highlights, the version of iPlayer for Apple’s iPhone and iPod touch offers streaming only, and requires the persistent use of WiFi for access. In contrast, the upcoming version for Nokia’s N96 can be streamed over 3G and WiFi (though the former could incur the user with hefty data charges depending on their mobile phone tariff), or downloaded and stored on the handset itself for off-line playback. The latter presents a much better option for many users, since content can be downloaded over WiFi when available, to be watched at a later date outside of a WiFi hotspot and avoiding 3G data charges altogether. It’s also not clear if carriers will prohibit access to iPlayer over 3G or offer it for an additional fee. Secondly, by announcing the partnership with Nokia today, the BBC is inadvertently promoting a handset that isn’t yet widely available. The N96 is due to go on general release in the UK on the 1st of October, the same day that a compatible version of iPlayer will be offered. This leaves the BBC open to criticism that it’s favoring one commercial player over others, and begs the question as to why it hasn’t chosen to support equivalent handsets that viewers already own rather than one that is yet to hit the market. Slightly off topic, doesn’t the BBC realize they could make some additional cash by selling subscriptions to non-UK residents? Maybe I don’t fully get the licensing, but it seems to me that’d be within their rights. Unless they worry it’ll kill BBCA. Or maybe they just haven’t gotten around to it.